Trim rough ends from asparagus; discard. Cut off asparagus tips and reserve. Cut stalks into 3/4 inch-long pieces. Place 2/3 of stalk pieces, 1 cup broth and 1 cup water in blender, reserving the remaining 1/3 of stalk pieces. Melt butter in heavy large saucepan over medium heat. Add onion and saute until tender, about 8 minutes. Add rice and stir 1 minute. Add wine and cook until absorbed, stirring often, about 2 minutes. Add 1/2 cup broth and chopped rosemary, simmer until liquid is absorbed, stirring often, about 4 minutes. Continue to cook for 15 minutes, adding more broth by 1/2 cupfuls and allowing liquid to be absorbed before adding more, stirring often. 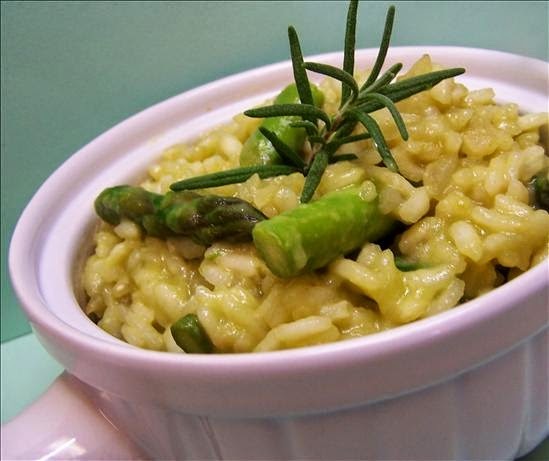 Add reserved asparagus stalk pieces and reserved asparagus tips and continue cooking until rice is just tender and mixture is creamy; adding broth as needed and stirring often, about 10 minutes longer. Add reserved asparagus puree and stir until absorbed, about 3 minutes. Stir in 1/2 cup Parmesan and cream. Garnish with rosemary sprigs, if desired. Serve, passing remaining Parmesan separately.